Did you learn much history when you were in school? I didn't. Not that I remember, anyway. The class I remember best included copying down notes from an overhead projector as my teacher read them to us. Scintillating stuff. I *love* that as homeschoolers, we can make history more engaging. When I had the opportunity to review the Digital Heroes and Heroines of the Past: American History Curriculum from Golden Prairie Press, I was interested to see what it was all about. Amy Puetz, the author, loves history and writes books to show history at its best from a Christian viewpoint. Heroes and Heroines of the Past, Part 1 (TOC and Introduction)(Sample) and Heroes and Heroines of the Past, Part 2: These two books make up the "spine" of the program. They cover the Discovery of American (Vikings, Columbus) through the Obama administration. This course provides a one-year overview of American history. Additional Materials CD - Lots of great stuff here! There are timelines, maps, and games, among other things. When you read about Columbus and his coat of arms, you can print off a copy to color and discuss. There is also a file containing all the pictures used for picture study, so you can print them off in a larger format if you like. Historical Skits PDF ebook - There are 19 skits, some written by Amy, some by other authors. (TOC and Sample Pages) Skits are a fun way to encourage your children to connect with what they're reading, although I confess mine are not fans of acting anything out. Alas. Listen to Some U.S. History CD - This also came as a download, and contains 20 MP3 audio files. Some are historical documents read aloud, like the Mayflower Compact, the Declaration of Independence, and the Constitution. Others are documents of faith, letters, poems, and speeches. There are literature books that go along with the program as well, which are intended for 5th and 6th graders to read as they use the program, and are optional as read-alouds with younger children. Also, at the end of each time period there is a list of recommended resources, which are mostly living books you can read along with your studies to add more interest. week) readings. If you went with 4 days per week, it would stretch into 37.5 weeks. The readings are divided into two sections: the first has one page with larger font presenting a general overview for younger students (1st & 2nd grades), and the second with more in-depth information for 3rd-6th graders. Lessons take anywhere from 30 minutes to an hour, and you could choose to do fewer activities depending on your child's interest and how much time you have. Isaac, for example, at just 6 years old didn't do the writing assignments, but he had a great time making a teepee, making a canoe out of play dough, and making succotash. The questions at the end of each section were helpful as a way of introducing him to narration. When I originally looked over the curriculum, I wasn't sure how I felt about the portion written for younger children. Even at age 6, Isaac is capable of understanding the language in the section for older students. However, he was not interested in listening to a long reading and then going on to activities, so the shorter, 1-page readings for younger children worked out to be a good fit for him, particularly since there were readings scheduled every day. This is a well-done curriculum. I liked the narrative style of the readings, and I love that we read lots of biographies of historical figures. Amy has obviously worked hard to make this easy for parents to use. 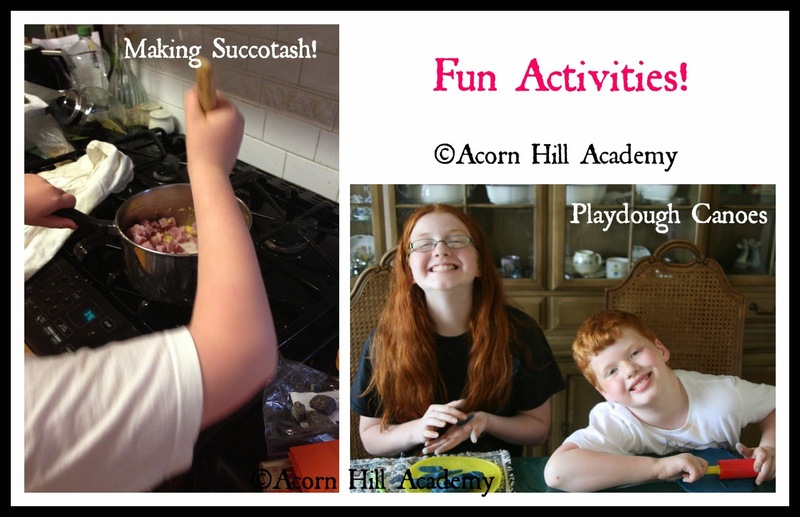 Within each lesson, there is clear direction to any resources you might need, such as the play dough recipe and instructions to make a canoe, or a recipe, or a song or other audio file. It's very simple to follow and the curriculum comes with everything you need to complete it. For my own homeschool, I wouldn't necessarily choose a one-year overview of American history. I follow a more Charlotte Mason-inspired schedule, which would go at a much slower pace and study each topic more in-depth. However, if you're looking for a one-year overview of U.S. History, this is a great option! I've had friends ask about just such thing recently, and I've pointed them to this curriculum. Digital Heroes and Heroines of the Past: American History Curriculum is available from Golden Prairie Press for $98.99. Connect with Golden Prairie Press on Facebook!